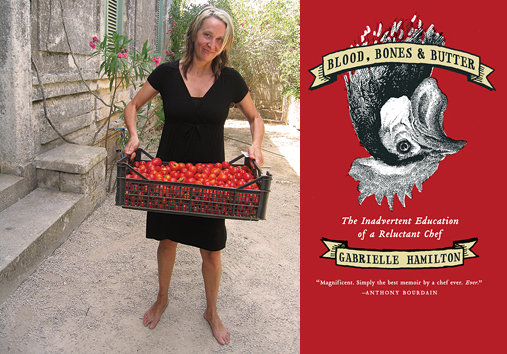 If you’re looking for a really good memoir, I recommend Blood, Bones and Butter by Gabrielle Hamilton. Gabrielle opened the critically acclaimed restaurant in New York, Prune, but the book is about the rocky road she took to get to that success. She writes about her upbringings on a farm in New Jersey with a bunch of siblings and an exotic mother who spent her day cooking. I loved her descriptions in the book. It was poetic and vivid and kept me glued to the page. I could picture everything she wrote about like I was watching it in a movie. Her mother was a huge influence on her life and yet the mother wasn’t in the book very much after the beginning. That above quote is an example of her gorgeous writing. Can’t you just picture that woman in the 1960’s? And she goes on to describe her mother who always cooked wearing heels, a dress, and full makeup. Her parents divorced when she was about 14 and her mother moved to Vermont. Gabrielle started a life of drugs and crime (and even got arrested for larceny in New York). She was 17 when she went to New York on her own with little to no money and became a waitress. This was her entry into the culinary world. She worked as a short order cook, worked as the chef of a rich kids’ summer camp, she was even an assistant chef for a catering company. She goes on to describe the dark side of wedding catering. The bride and groom go to a private tasting for just the two of them, months in advance. Each ingredient hand-selected by the chef and prepared that day. She describes the large scale production of how thousands of portions are prepared. Sure does take the magic out of the moment, huh? That’s why wedding cake is so awful–it was prepared probably a week in advance (especially for those opulent ones) and sat in a fridge somewhere drying out. Gross. I loved that she basically fell into cooking because she had no skills as a teenager, grew to love it, and then decide to teach herself how to do it. Traveling the world and exploring different foods instead of going to some fancy chef school sounds like such a better education–and definitely more fun. She spends some time in the middle of the book describing her path to opening her first restaurant, the struggles she went through that I’m sure all chefs encounter, and how she became successful. 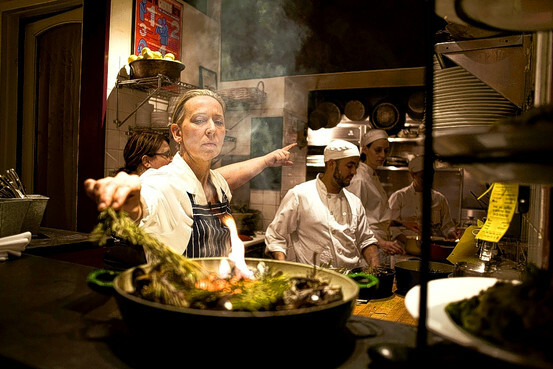 The grassroots method of her opening her restaurant was fascinating to read about. The last 1/4 of the book, however, wasn’t as great as the first half. I felt like she was a really unhappy person and a lot of that unhappiness was of her own making. For example, she married an Italian doctor who immediately lost interest in courting her pretty much the second they signed the marriage license. She describes their relationship as essentially being buddies who got together a few times to have two kids and then go home to Italy once a year to see his family. They didn’t live together (separate apartments) and had no loving relationship whatsoever. It was such a turn off for me. The whole book she was painting herself as a strong feminist and then she signs up for (and stays in) a loveless marriage? It was just so odd. Despite that disappointing part of the book, I enjoyed the rest of it. I loved her writing style and the words she chose to describe things painted a picture for me so vivid I felt like I was there. The grittiness, the apathy, the happiness…all present in her words. If you’re nervous about descriptions of animal butchering (the title kind of made me nervous) don’t worry. There was really only one paragraph in the book that was too much for me to read. It was more about the rest of the story and not the actual act of butchering and cooking animals. If you’re interested in reading memoirs or memoirs about chefs in particular, I’d recommend this book. Just be prepared for it to not be a “and they lived happily ever after” kind of book. QUESTION: Have you read this book? What did you think? I am pretty sure it is Italy–she went there once a year with her husband because he was from there. I am not sure where is from she.. but so far I can guess after reading your post she is a good lady. Miz recently posted..How do you run with a dog? That’s cool that you read it too! It’s nice to hear other people’s opinions. Oh my gosh…the thought that there would be animal butchering in the book never occurred to me! I automatically assumed the title was a play on “Blood, Sweat, and Tears.” Glad to hear that there wasn’t much gore either way. I love reading stories about people who buck the conventional paths to their careers! It sounds like she has a lot of great stories to tell. She definitely had some good stories. The first half of the book was great. It was interesting the route she took to opening a restaurant. It’s almost like she fell into it.